Samyang 24mm F1.4 ED AS UMC (AE) lens review: Best 24mm lens for Nikon full-frame users? With an extensive field of view and good close focus capability, the 24mm focal length is one of the most popular wide-angle models in a maker’s range. In the past the choice of ultra-high speed models has been limited to the expertise of the camera marques but that’s no longer the case. 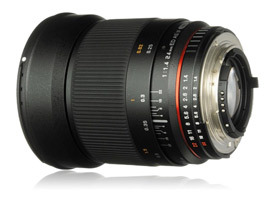 South Korea lens maker Samyang has a manual focus only model, the 24mm f1.4 ED AS UMC, at just $669. At that price it lacks niceties such as auto-focus but unlike the recently reviewed Canon mount version the Nikon mount (AE) model has a built-in CPU and data-bus contacts (like the manual focus Zeiss ZE model) allowing full compatibility with various exposure and metering models employed by current Nikon DSLR. Crucially it has automatic aperture control, which is a big plus over the Canon model but it is expected these days regardless of price. The optical construction is a real highlight and reads like a top-tier model. It has 13 elements in 12 groups, including four ED glass elements to minimize chromatic aberration and two aspherical elements to reduce spherical aberration. With a 77mm filter thread and measuring 3.27 x 3.74″ (83 x 95 mm) this is a big lens, and at over half a Kilo (580g) or 20.46 oz it’s the weight of some DSLRs. The best performing 24mm lens on the Nikon D800 is, surprisingly perhaps, not the relatively new AF-S Nikkor 24mm f1.4G ED but the marginally more affordable manual focus Zeiss Distagon T* 2,0/25 ZF.2. As we can see from the DxOMark score it’s highly corrected, like the Nikkor, but along with a more modest maximum aperture it has noticeably higher peak sharpness. Although the Nikkor is a superb performer, the Zeiss is sharper at every aperture. Even at the initial aperture, the Zeiss has better sharpness and uniformity than Nikkor at f2.0. In third place is the Samyang. 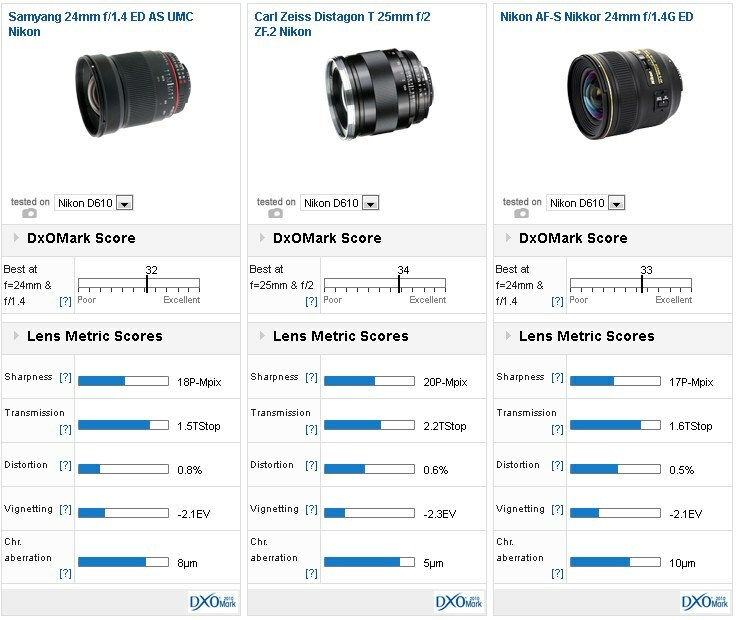 It has almost the same DxOMark score, while peak sharpness surpasses even that of the excellent Nikkor. A high DxOMark score of 33 points is unusual for a $660 lens. It has very high peak sharpness (achieved at f4), good transmission and low chromatic aberration. Full-aperture performance is very good, at least in the center, but like most models sharpness improves when stopped down. Optimal performance is achieved at f5.6. Distortion is a little higher than expected but it’s not excessive. With a a relatively simple profile it’s easy to correct in software. Chromatic aberration is also very well controlled at maximum aperture. However, vignetting is high with over -2Ev measured in the extreme corners, though this is no reason for concern with digital cameras (it would be troublesome with film). 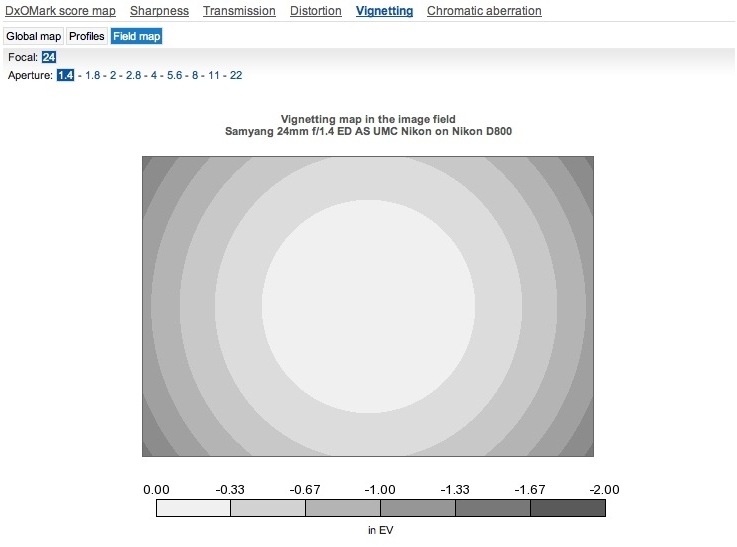 Vignetting is slightly higher than expected, but it’s easy to remove in software, if necessary. As expected sharpness is a little lower on the 24-Mpix Nikon D610 but the Samyang performs well in most areas, but not that sharpness at full-aperture isn’t quite as good when paired with the higher-resolution Nikon D800. 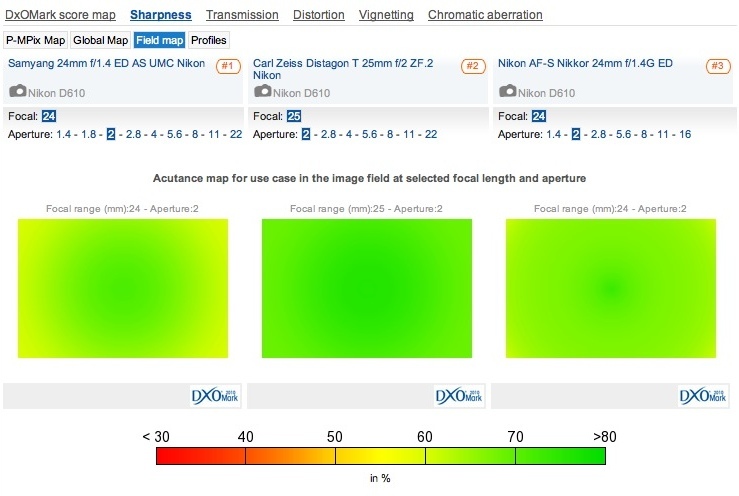 Full aperture performance is on a par with the Nikkor – better even in the center. The Nikon has some slight curvature of field. At f2, however, neither the Samyang nor the Nikkor can match the sharpness or uniformity of the Zeiss. The Zeiss has outstanding sharpness across the field. And it has even more in reserve for the D800. Where the Nikkor has a peak sharpness of 17P-Mpix on both the Nikon D610 and D800, the Zeiss was measured with 22P-Mpix on the D800. The four anomalous partial dispersion type glass elements in the Zeiss also keep chromatic aberration to a minimum while the only slight downside is somewhat heavy vignetting at maximum aperture, though that’s the least worrisome issue. The Samyang is very good performer but it lacks the uniformity of both the Zeiss and the Nikkor at least until stopped down to f4-5.6 where the edges are practically at the same level as the center. Although the Samyang is an excellent performer for the price, it lacks the performance at the wider apertures of the Zeiss and, to a lesser degree, the Nikkor. Given the price, the Samyang is a tempting choice but it lacks the outright performance of both the Nikkor and the Zeiss where it counts most for this type of lens. Nevertheless, performance is still very good at the wider-apertures, and as this model has both the convenience of a built-in CPU and an auto-aperture it’s a far more attractive proposition than the EF mount version is to Canon users. It’s not the best performer optically, that title goes to the Zeiss and if you must have AF, the choice then is limited to the Nikkor, however the Samyang is a decent performer and offers great value.